The DGA Mach 2 is an excellent entry-level permanent style basket. It is great for all recreational level courses including schools, camps, backyards and neighborhood courses. The DGA Mach 2 model comes standard with the portable base and two-piece pole inside one box, making it convenient to ship. DGA offers an In-ground Conversion Kit that allows the DGA Mach 2 to be permanently installed. Patented Sliding link technology softening the discs impact to the chains The DGA Mach 2 basket comes with DGA’s industry pioneering 20 Year Warranty and is PDGA approved at standard tournament level. By DGA, the founding company of disc golf and the standard for disc golf baskets. 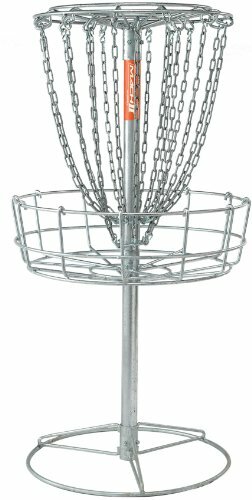 Durable, heavy-duty steel, portable, outdoor, all galvanized practice disc golf basket. Excellent, weather resistant, high quality and tough disc golf target for practice, playing casual disc golf or for standard tournament level play. Comes standard with portable base. DGA Mach 2 is a permanent style disc golf target suitable for permanent outdoor installation. The target is portable, with a standard freestanding metal base. The weather resistant hot dipped galvanize finish withstands weathering from the harsh outdoors. Manufacturer: Disc Golf Association, Inc. Publisher: Disc Golf Association, Inc. Studio: Disc Golf Association, Inc. If you have any questions about this product by DGA, contact us by completing and submitting the form below. If you are looking for a specif part number, please include it with your message.